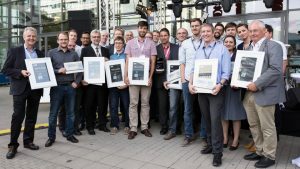 September 21, 2018: Founders and various employees of Vanguard Photonics as well as Vanguard Automation received the Second Prize of the prestigious Berthold Leibinger Innovationspreis 2018. The 10th Award Ceremony took place on September 21, 2018, in Ditzingen, Germany. More than 500 guests from all over the world participated at the event. The encomium was held by Prof. Dr.-Ing. Wolfgang Marquardt, Chairman of the Board, Forschungszentrum Jülich. July 13, 2018: The KIT project team DELPHI (3D Laser Lithography for Photonic Integration), headed by Prof. Dr. Christian Koos together with Vanguard Photonics GmbH won Second Prize of the Berthold Leibinger Innovationspreis 2018. DELPHI is dedicated to industrial adoption of femtosecond laser lithography as a tool for 3D additive nanofabrication in integrated photonics. The concept of multi-photon polymerization is exploited to fabricate single-mode photonic waveguides and free-form micro-optical elements for efficient coupling of optical chips. 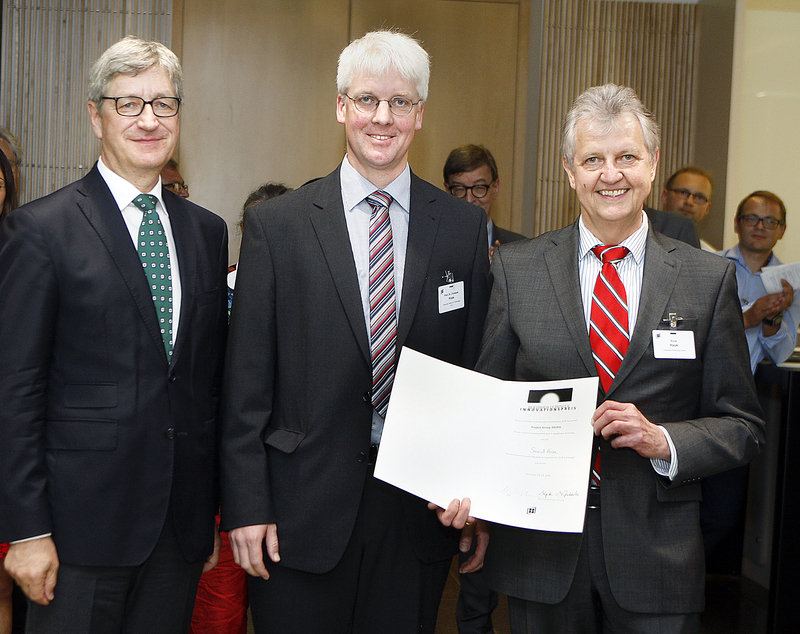 The Berthold Leibinger Innovationspreis has been called for internationally since 2000. It was complemented in 2006 with the Berthold Leibinger Zukunftspreis for research. 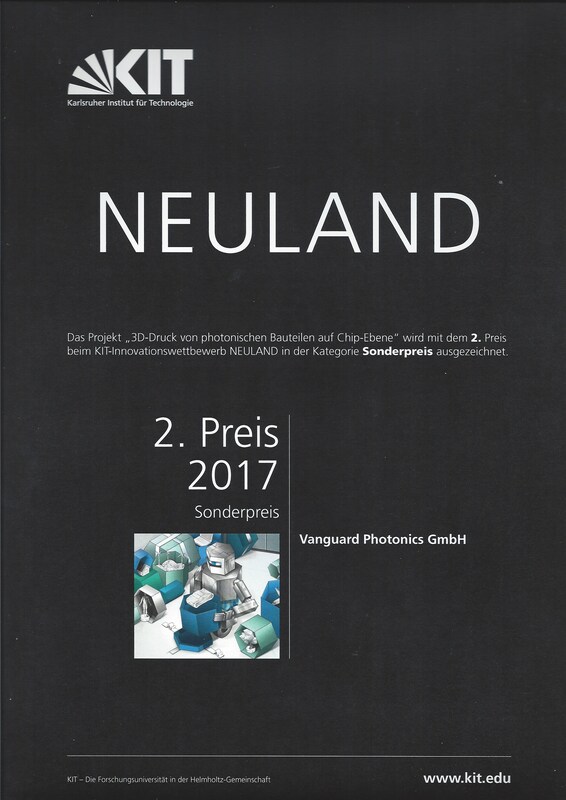 Both prizes are presented every two years at the award ceremony, an established event and meeting place of the large laser community of researchers and users with representatives of industry, politics, and society. The invention of the laser in the middle of the twentieth century was a quantum leap: light could now be tailored to specific needs, working very precisely and without physical contact. The advancement and acknowledgement of outstanding development and scientific work on the application or generation of laser light is one of the objectives of the Berthold Leibinger Stiftung. 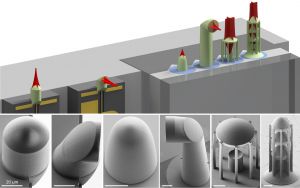 Vanguard Photonics’ collaborators at Karlsruhe Institute of Technology (KIT) have recently published a new method that allows to connect single-mode components using 3D-printed freeform optics in Nature Photonics see https://www.nature.com/articles/s41566-018-0133-4 to find out more. This year, with our daughter company Vanguard Automation, we’ve been at the OFC in San Diego, California, USA. We found lot’s of customer interest, especially on our industrial photonic multi chip integration using photonic wire bonds (PWB). 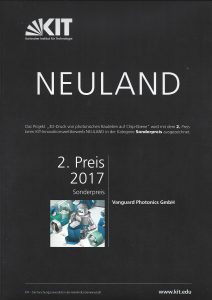 June 28, 2017: Toge ther with its partnering research institute KIT-IPQ, Vanguard Photonics won the 2nd place at the KIT – Innovation Award “NEULAND” for its innovative capabilities of “3D printing of photonic wire bonds on chip level”. In this prize-category, the initiation of successful cooperation between KIT and an industrial partner are recognized. The last few years KIT Venture Fest has been rediscovered and further developed. It is now the central “Innovationstag NEULAND” with a broader thematic spectrum. Participants have the possibility to get to know innovative ideas, technologies and start-up projects of students, scientific employees and professors. This year, already the 5th annual event took place.